Spring 2017 Part 2 picks up where Spring 2017 Part 1 left off with us camped at our temporary home base in Farmington, New Mexico. We had one more bucket list item to take care of before continuing north towards Yellowstone National Park. 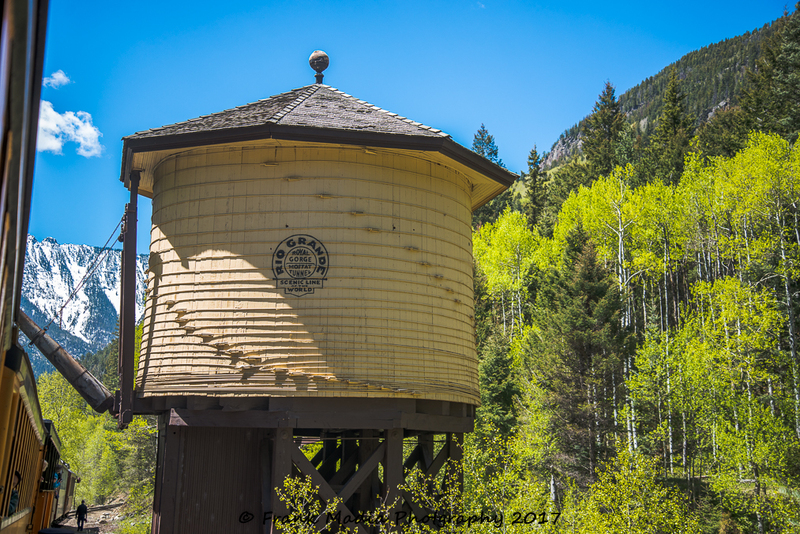 For years we had talked about taking the train from Durango to Silverton, Colorado. 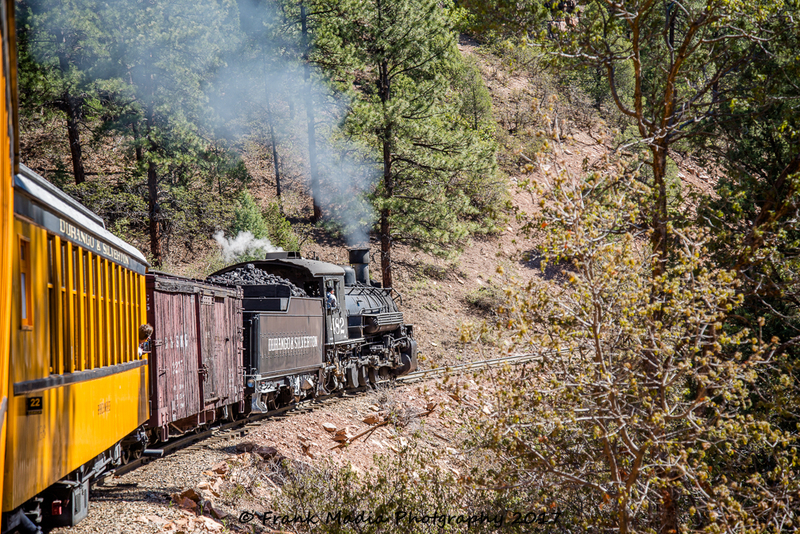 Of course, the Durango & Silverton Narrow Gauge Railroad was the way to get there. 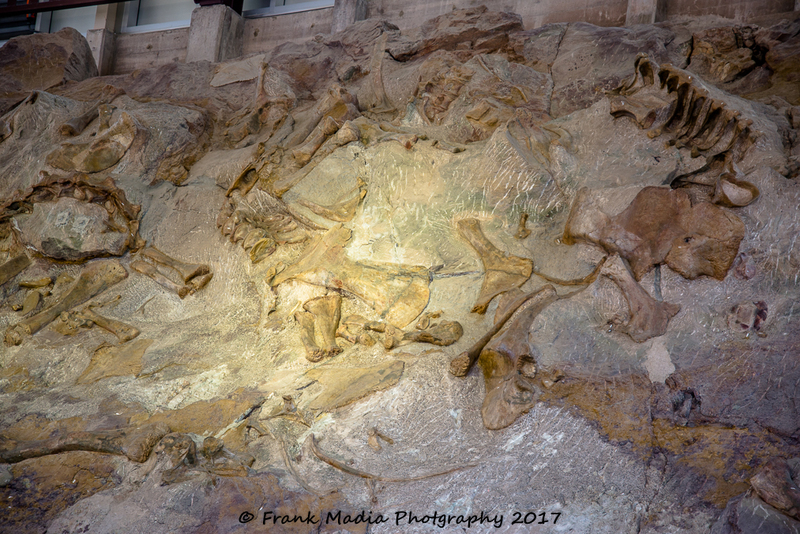 We also wanted to revisit the Dinosaur National Monument which straddles the Utah, Colorado border to the north. We would necessarily need to change bases to accomplish the latter. The drive from Farmington to Durango covered much of the same route as we had taken to get to Mesa Verde National Park the day before. So, to ensure we wouldn’t arrive too late we decided that on our way back to Farmington from Mesa Verde we would extend our day with a side trip to Durango leaving us a straight shot back to Farmington on the exact route we would be taking in the early hours of the following day. This excursion gave us the opportunity to check out where we would be parking and where and what we would likely be eating for breakfast. We also looked around a bit to see where we might want to eat dinner following our return from Silverton. Once we were satisfied we would not get lost or confused we headed back to Farmington and a relaxing dinner after a full day of sightseeing. The next morning, we were up and on the road much earlier than usual because we had a bit over an hour’s drive to get to Durango and being late was not an option. On our reconnaissance trip, we learned there was some road construction along our route and we certainly didn’t want that to play a role in our shared stress level. As it turned out, arrived with plenty of time to park the car and stop in at the local Starbucks for a light breakfast. After breakfast and a bit of relaxation, we walked to the train station and picked up our tickets before a brief walkthrough of the gift shop and museum. We were actually early! Our early arrival gave me an opportunity to make a few images of the station and the train on which we would spend most of the rest of the day. 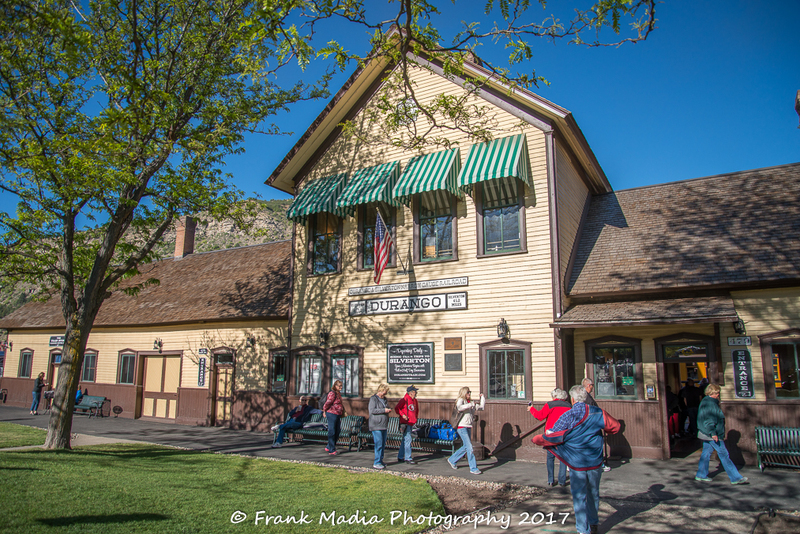 When we arrived at the Durango & Silverton Narrow Gauge Train station in Durango we were delighted that it was such a clear and beautiful day, albeit a bit on the cool side. We would soon be heading off towards the mountains in this vintage train. Just so you know, we were both on the trip. 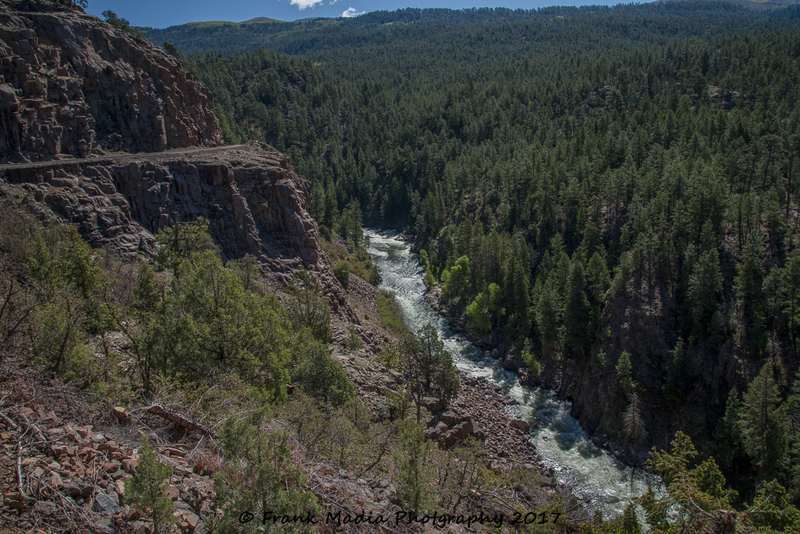 Durango, Colorado was founded by the Denver & Rio Grande Railway in 1879. 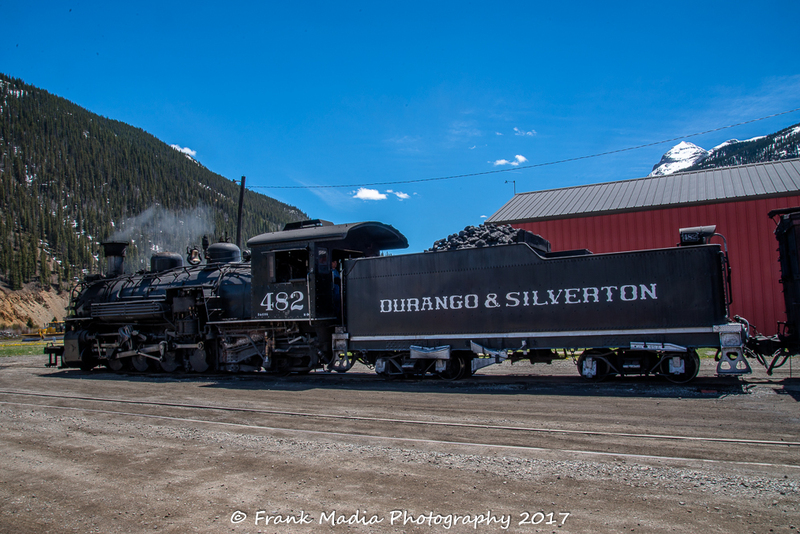 The railroad arrived in Durango on August 5, 1881, and construction on the line to Silverton began in the fall of the same year. By July of 1882, the tracks to Silverton were completed, and the train began hauling both freight and passengers. 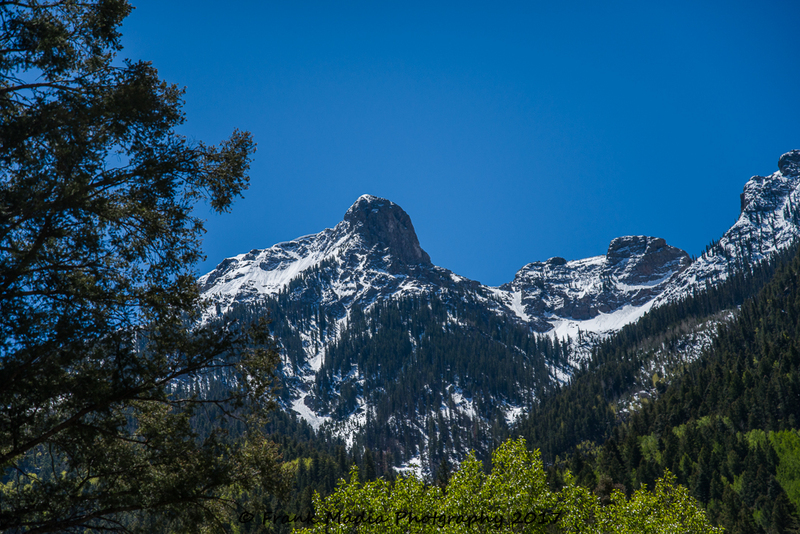 The line was constructed to haul silver and gold ore from the San Juan Mountains, but passengers soon realized it was the view that was truly precious. 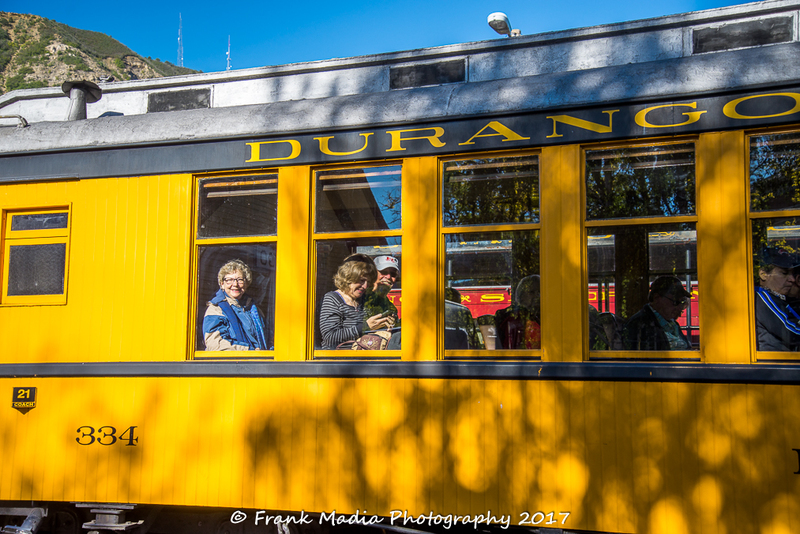 The train has been in continuous operation between Durango and Silverton since 1882. 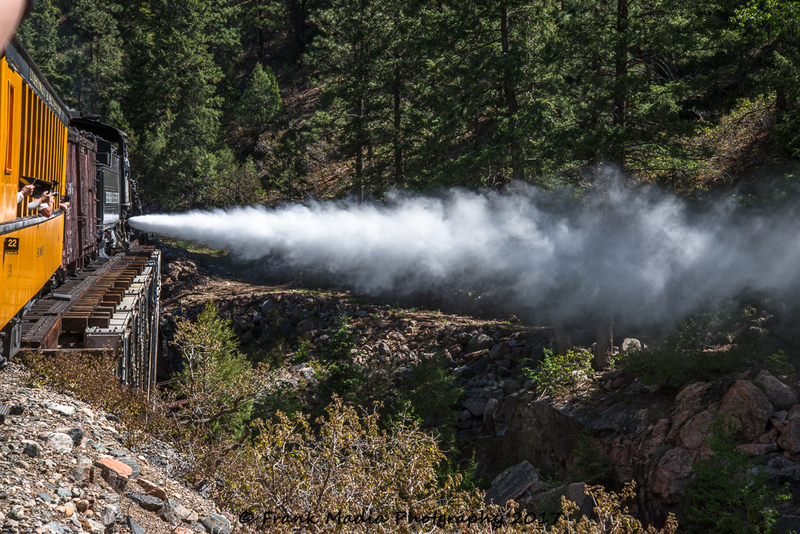 Today, the train utilizes vintage coal-fired steam locomotives and rolling stock indigenous to the line. Most importantly, much of the line travels through areas that are inaccessible by a highway. The easiest way to complete this story is through the images I was able to capture along the way and while in Silverton. I hope you enjoy the trip. 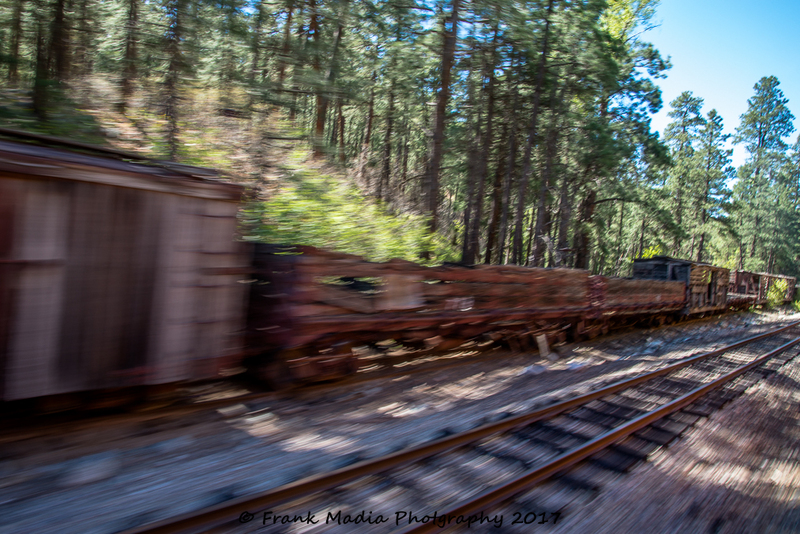 On the way to Silverton, I made a lot of photographs showing the train winding its way along the tracks. I have always enjoyed watching a train from inside the same train. Every turn of the track offered a different look at this historic piece of equipment. 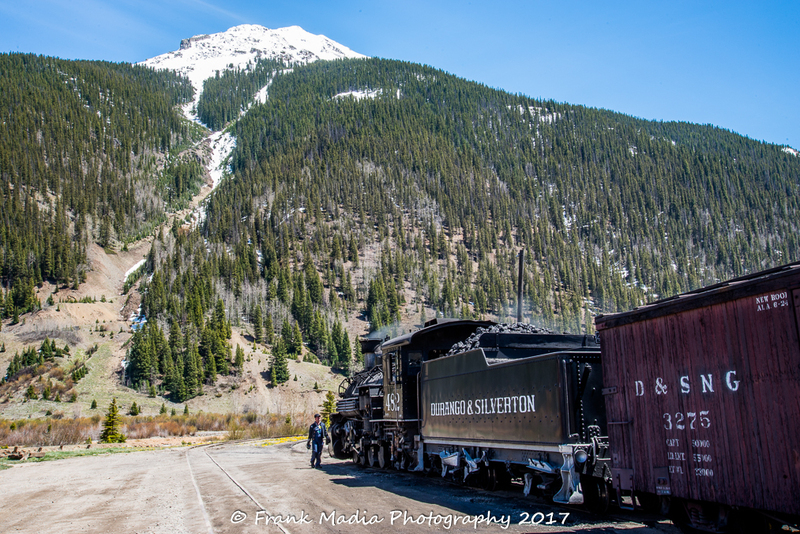 The boxcar just behind the coal car is used to carry freight of all sorts, including baggage for anyone who intends to stay in Silverton. That car is no newer than any of the other bits of rolling stock currently in use by the railroad. 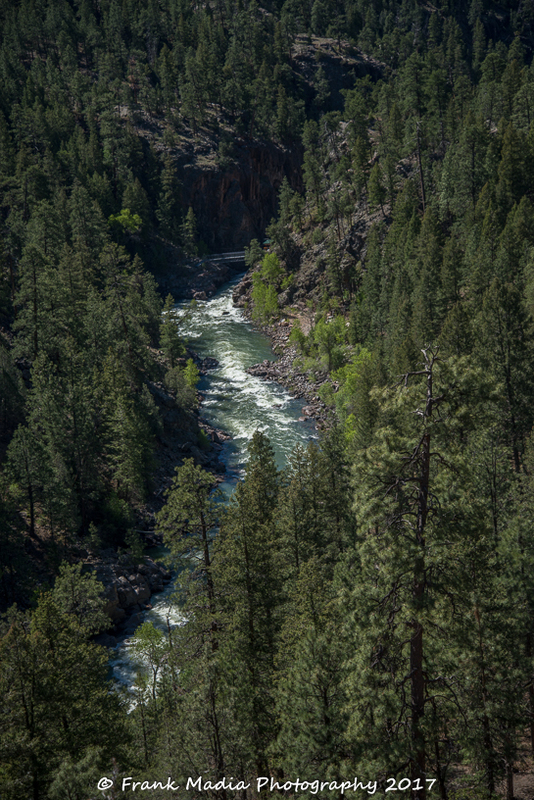 As we traveled north into the San Juan National Forest, we never strayed too far from the Animas River. In these modern times, the river is also paralleled by US 550. Fortunately, for most of the trip, you cannot see the highway from the train. 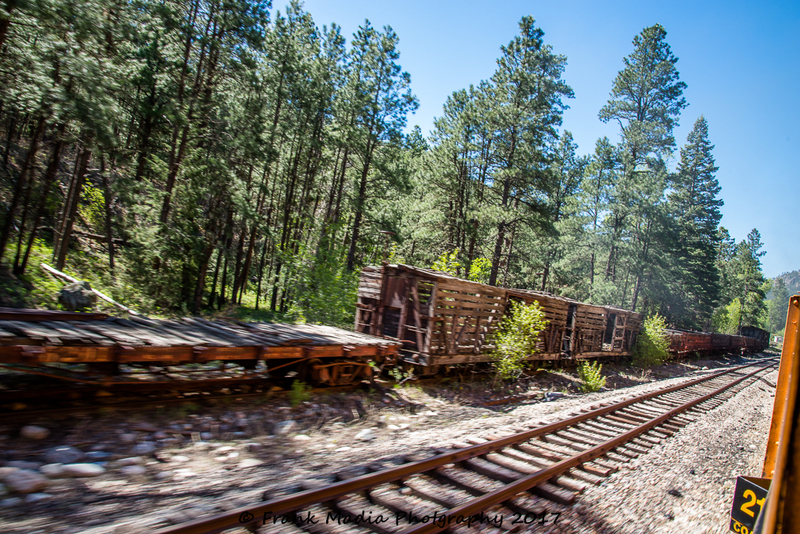 This fact allows one to see the countryside as it was in the late 1800s when silver and gold ore was being moved from Silverton to Durango along these rails. By the way, that is the railroad track in the upper left portion of this image, not the highway. On both the trip up and again on the return, the engineer stopped along the way to blow hot steaming water from the boiler. When the sun is right you can see a brilliant small rainbow in the resulting vapor. We only saw the rainbow for a very brief moment. It was still neat to watch the plume going away from the engine. We passed some older freight cars that were parked on a siding. I tried to capture the motion of the train by slowing the shutter speed slightly and also shooting at an angle closer to perpendicular to the subject. You can be the judge as to my success. One attempt is never enough. 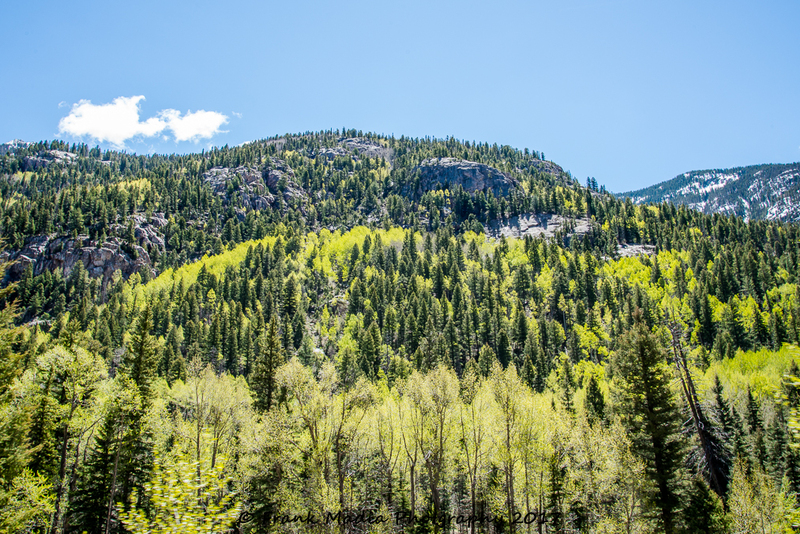 As we traveled through the forest, frequent breaks in the trees gave us great views of the mountain peaks we were passing. All steam engines require water to keep moving. This authentic steam engine that was pulling us up the mountain was no exception. We had to stop about midway along the route for a fill-up. We made this trip during the last full week of May. 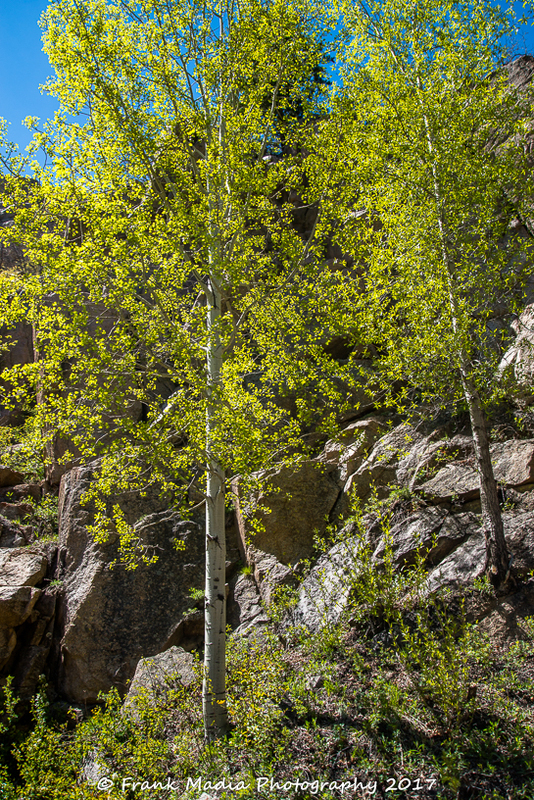 Therefore, at an elevation somewhere between our starting elevation of 6512 feet and our ending elevation of 9318 feet, spring was just getting going. 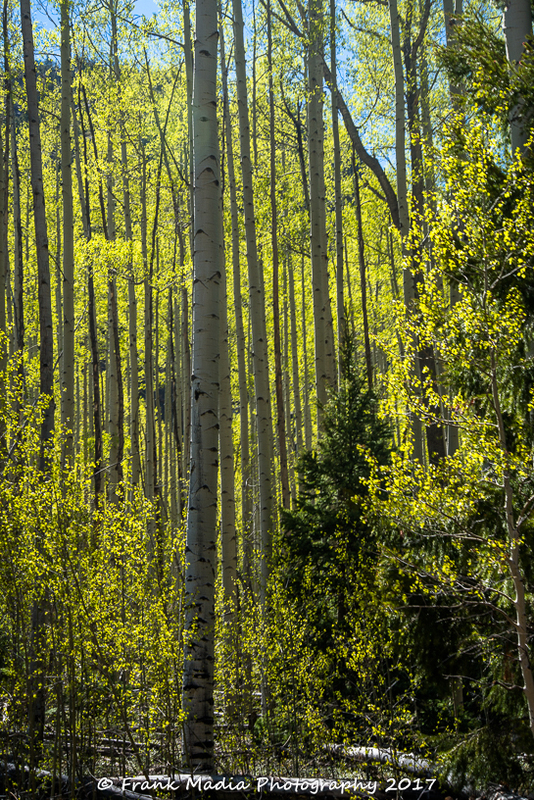 The leaves on the trees were small and a much paler green than they would eventually become. 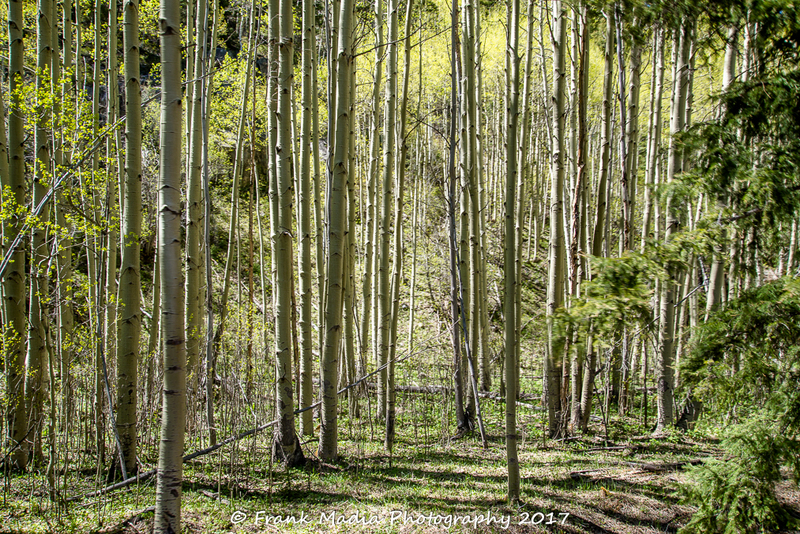 The contrast between the evergreens and the deciduous trees was candy to the eye. 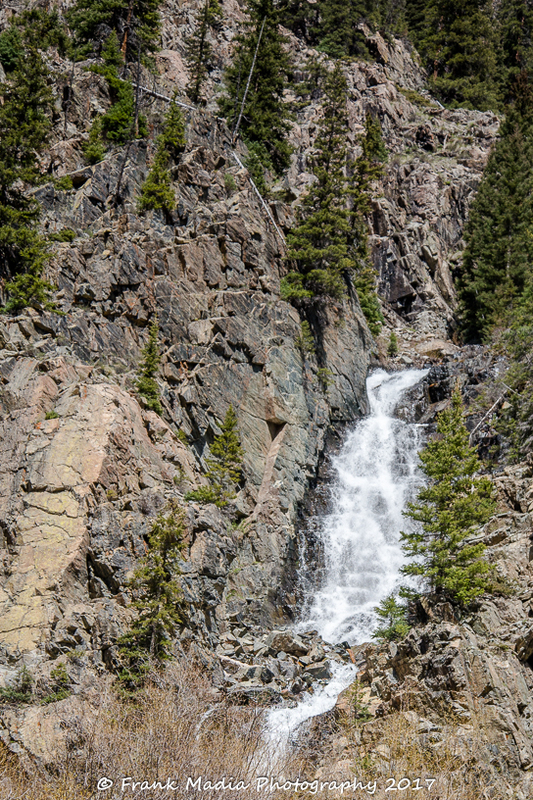 Spring also means there is an abundance of waterfalls tumbling down the canyons. We would see several and so will you in a few minutes. 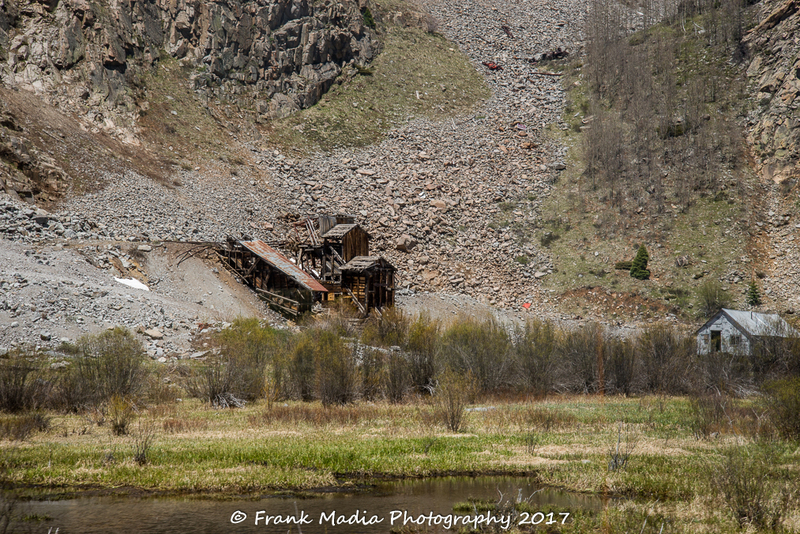 Not far out of Silverton we passed this abandoned mine that was once the reason for the train. 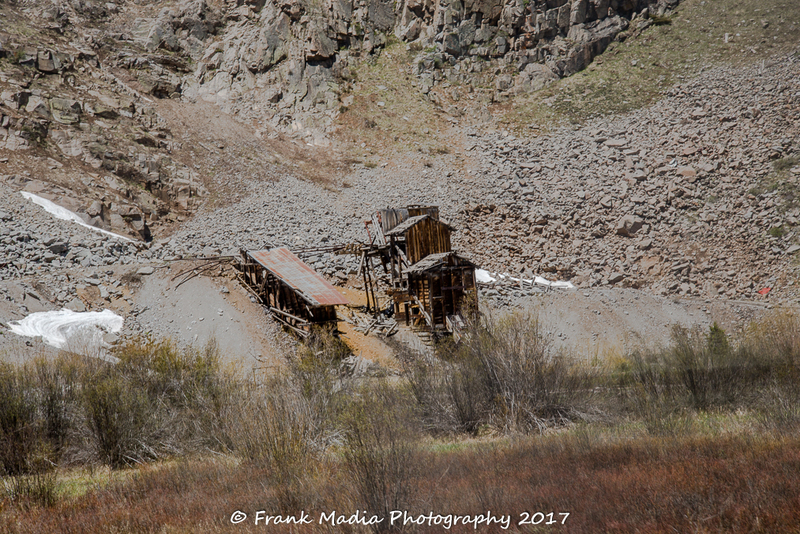 While I am not a great fan of extraction of minerals, especially in environmentally damaging methods, I have to admit to getting a certain enjoyment of photographing the ruins of such sites because of their character, shapes, and range of color. Our time in Silverton was about 2 hours. Therefore, the priority upon arriving was to find a place to eat. Since this is now a tourist destination, there was no shortage of places to eat and drink. With a trainload of hungry people descending on this small town at lunchtime, every eatery in town quickly fills. We found Handlebars several blocks from the depot thinking there would be fewer people. 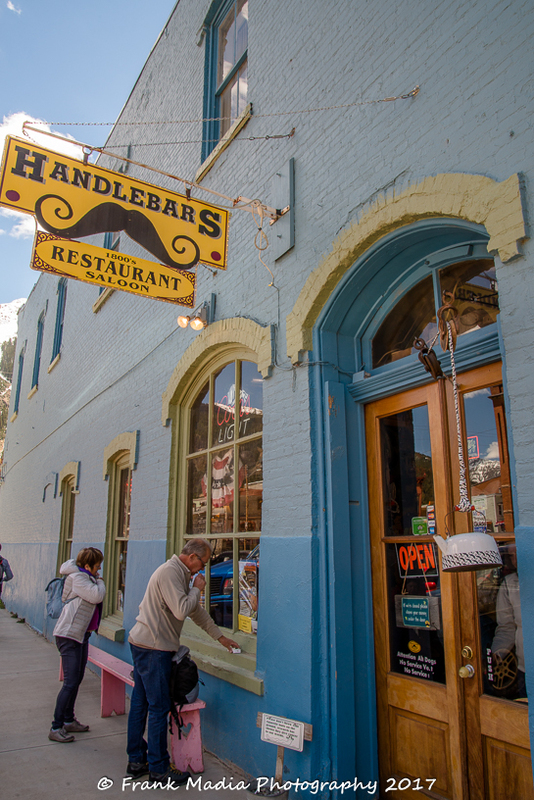 We were wrong, but the staff at Handlebars was prepared for the onslaught and got us seated and fed in plenty of time to wander around the rest of the small downtown area and do a little shopping before we had to re-board for the trip back to Durango. You may have noticed this teapot in the previous image. 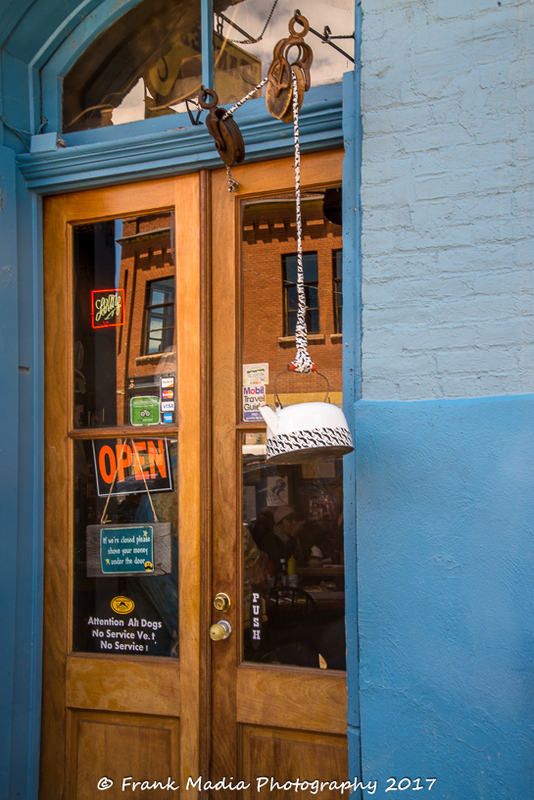 The purpose of the teapot is to function as a door closer for the entrance door to the restaurant. The pot is weighted and that weight pulling on a line connected via two pulleys to the door causes it to go shut once the door is let go. I can think of a lot of doors with much more sophisticated closure devices that do not work as well as this one does. 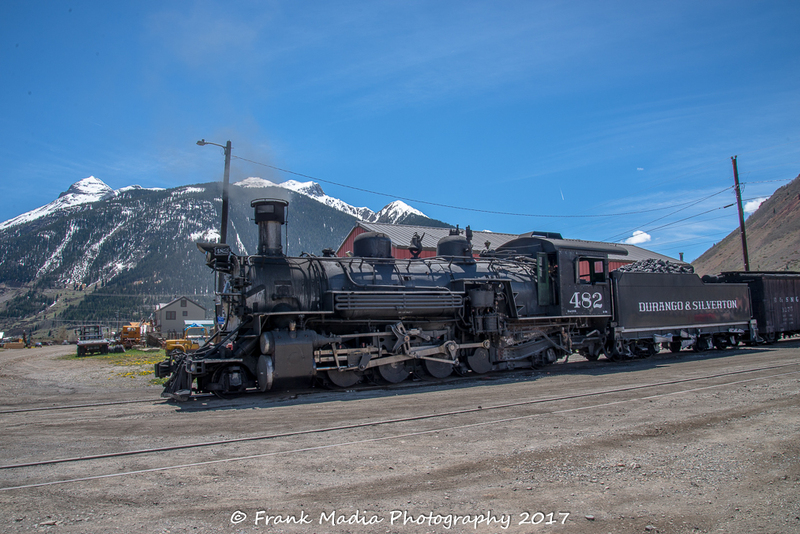 We returned to the train a little before boarding time, so I made a few photographs of the train to better show off this historic equipment. One final view. By the way, I believe that is Kendall Mountain in front of the train. 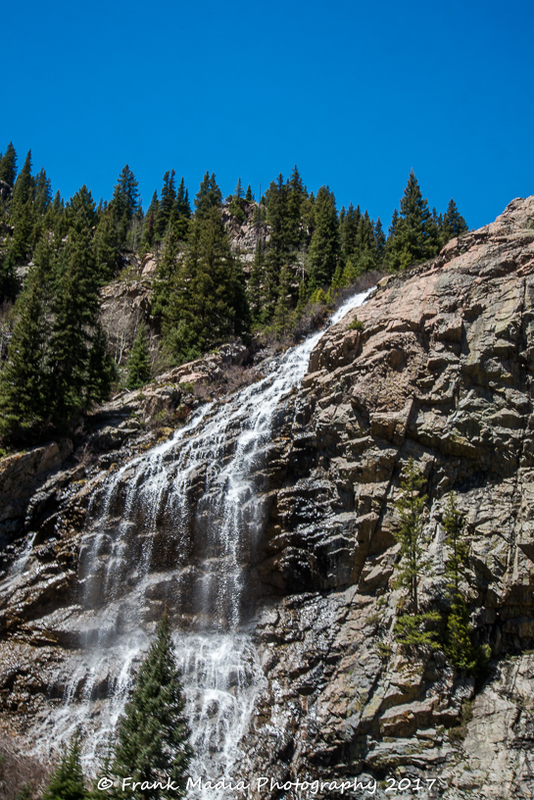 On the way back to Durango, I made several more photographs of waterfalls and spring trees. The train trip exhausted both of us, primarily from sensory overload. We had to stay alert as the next bend in the track, the next bird that flew over or the changing clouds made for a very busy day of constant looking. Our plan had been to have dinner in Durango but realizing that we were already exhausted and had an hour’s drive ahead of us dictated that dinner would have to wait until we returned to Farmington. This wise decision was none-the-less disappointing as we had spotted some really fun looking places to eat in Durango. Safety first! The following morning, we were on our way north with Dinosaur National Monument in our sights. The logistics got a bit complicated for a few days at this point in our journey. We wanted to visit a friend who lives in Meeker, Colorado. There were a couple of problems with our on the fly planning. First, we had yet to make contact with our friend to see if we would be able to meet somewhere. 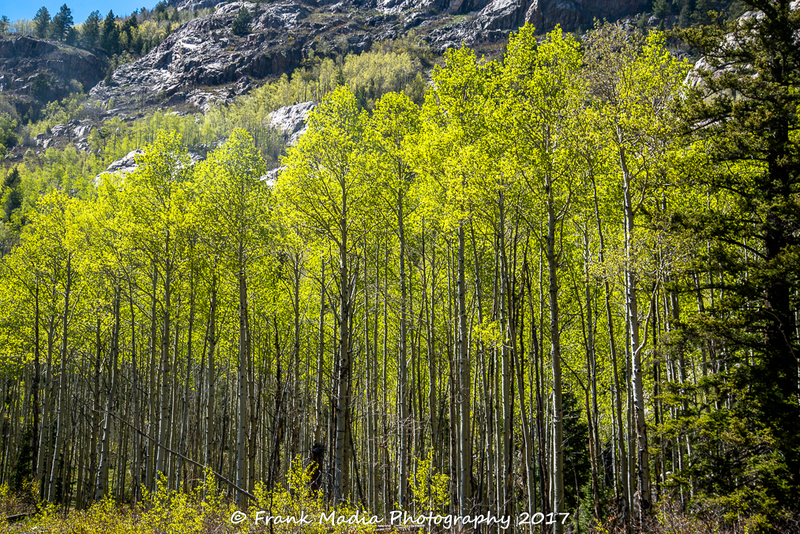 Second, the drive between Farmington and Meeker presented a challenge, not so much for the miles, but for the mountains. We broke the drive into two much shorter days, which was nice for me. We finally contacted our friend on the second day only to learn that she would not be in town. With that knowledge, we gave some thought to skipping the Meeker area altogether and continuing on to Jensen, Utah where we would base camp for our visit to the monument. 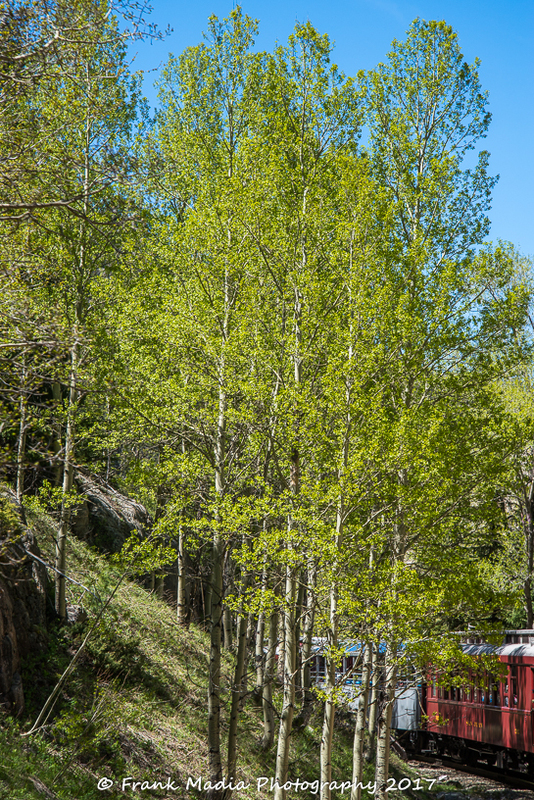 Those additional miles seemed to be more than I wanted to drive in a day, so we kept the Meeker area stop in the agenda staying at River Camp RV park on the White River just outside of Meeker. The RV park was about as peaceful as you could ask for and we spent most of the afternoon wandering along the bank of the river doing a little bird watching and just enjoying not being on the road. We did venture into Meeker where we found a wonderful Italian restaurant that made the day complete. 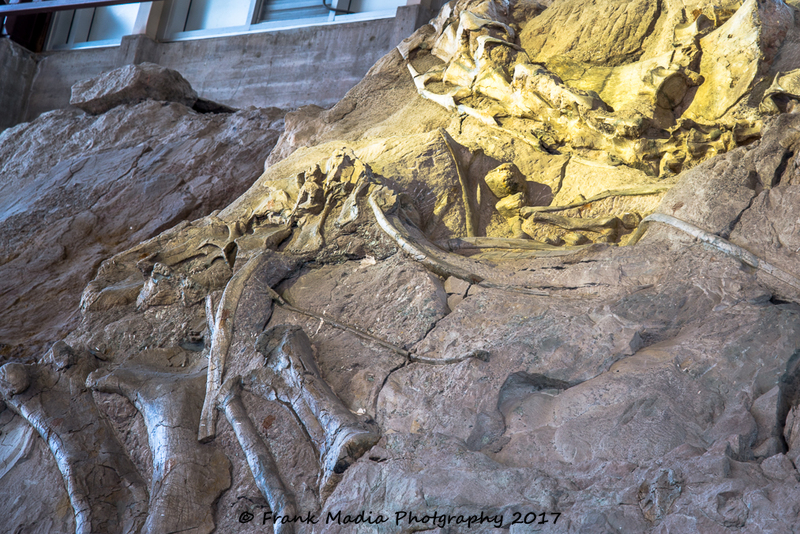 The last time we visited Dinosaur National Monument, I was unprepared for what we would see and by having to ride a bus to the Quarry Exhibit Hall, I incorrectly decided to leave my camera in the car. After being absolutely awestruck by what there was to see in the exhibit hall I was determined to return. That first visit was on a cold rainy day, a fact that contributed to my decision to go without my camera. The weather for our return visit this year wasn’t much better. While it wasn’t raining this time, the sky was cloudy, the wind was blowing, and it was chilly. 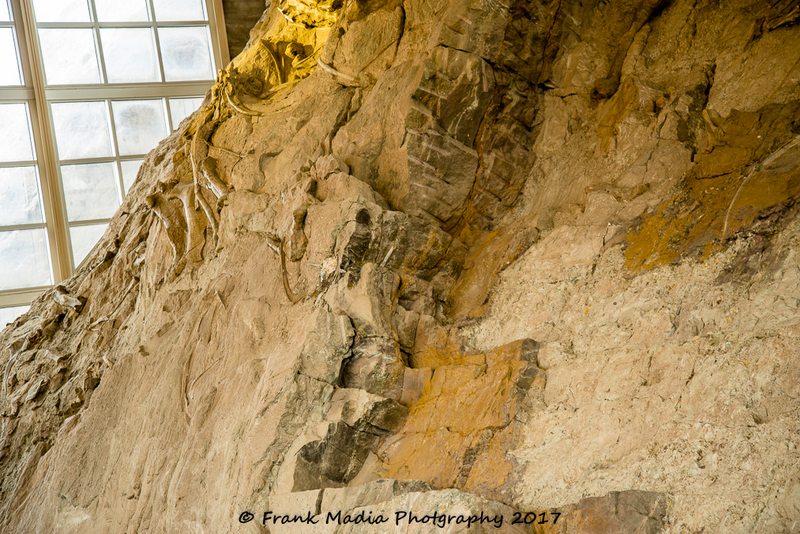 The Quarry Exhibit Hall at Dinosaur National Monument offers some photography challenges, to say the least. During our visit we had everything from fluorescent, tungsten, cloud-filtered sunlight, bright sunlight, to possibly mercury vapor light to account for while making images. In many of the images I made, there were multiple light sources of a wide spectrum of temperatures. Of course, what I saw through the viewfinder would not necessarily be the same as what I would eventually see on the computer. A good off the camera flash would probably make the mixed lighting a moot point, but I neither had one along nor thought it appropriate to be using one while other people were trying to enjoy the exhibit. I share the fact of these challenging issues as a prelude to what you are about to see. Once I had moved the images from this shoot into Lightroom, I knew I was going to have to make adjustments that would be outside my expertise level and my personal comfort level with regards to my long-standing philosophy regarding computer manipulation of images not gotten correct in the camera. Following a good deal of soul-searching as well as a review of which sliders in Lightroom I needed to use to bring life into the images, I decided that my philosophical stand had not been violated as I was doing what I had learned to do while processing film in the darkroom many years ago. That said, in the images you are about to view, you will likely notice that there is a range of color that seems inconsistent from one image to another. The simple explanation is the color shift follows the change of dominant light source for the specific location where I was standing while making the image. The images taken from the entrance end had a lot of sunlight, some filtered, some more direct along with spotlights that were likely tungsten. In the middle, there was a lot of fluorescent lighting and some tungsten spotlights competing with the small amount of natural lighting from windows to the top back of the exhibit. As we moved towards the exit end of the hall, there was more natural light dominating, but always in competition with the fluorescent and tungsten lights within the hall. My color adjustments were made to bring out the details that one can see while standing in front of the exhibit. I was not trying to trick anyone into seeing something that is not there for all to see. Ethically, this is an important distinction for me as I am frequently asked how much “photoshopping” I do to my images. My response is never a simple “none” because that could be misleading because even though I don’t own a copy of PhotoShop, I do make color corrections to my images in order to present to the viewer what I was able to see with my eyes at the time I made the photograph. 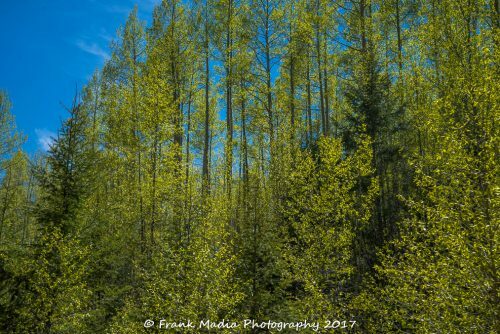 I do not try to adjust my images to make them look like what I would have liked to have seen with my eyes at the time the shutter was triggered. I hope this makes sense, as it is important to me in the presentation of my art. One final thought. There have been at least one or two occasions that I have really manipulated an image for this blog simply because I did not have an image I was comfortable sharing that was needed for the story I was telling. In all those instances I have been clear that the image was grossly adjusted. Those images would never find their way to the Portfolio page of this website. I will now let the photographs complete this story. Enjoy them and the incredible story they illustrate. 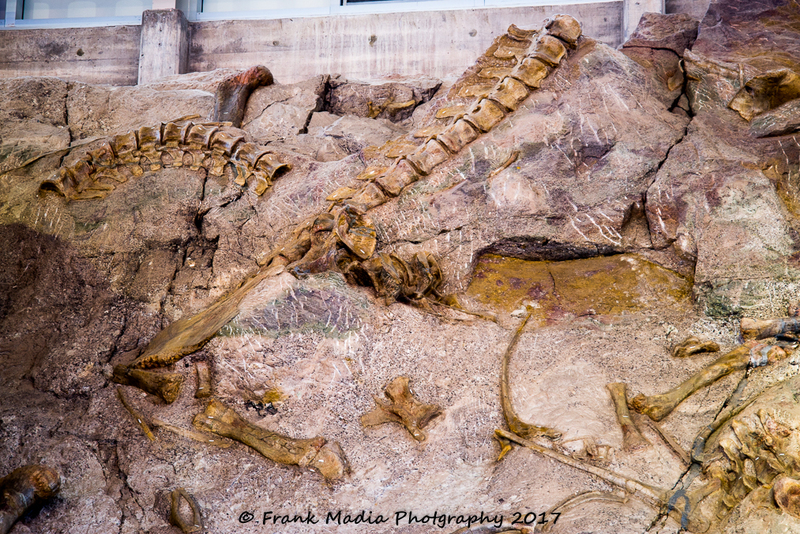 This was our second visit to Dinosaur National Monument. During our first visit, I did not take a camera. This time I came prepared with camera and tripod. 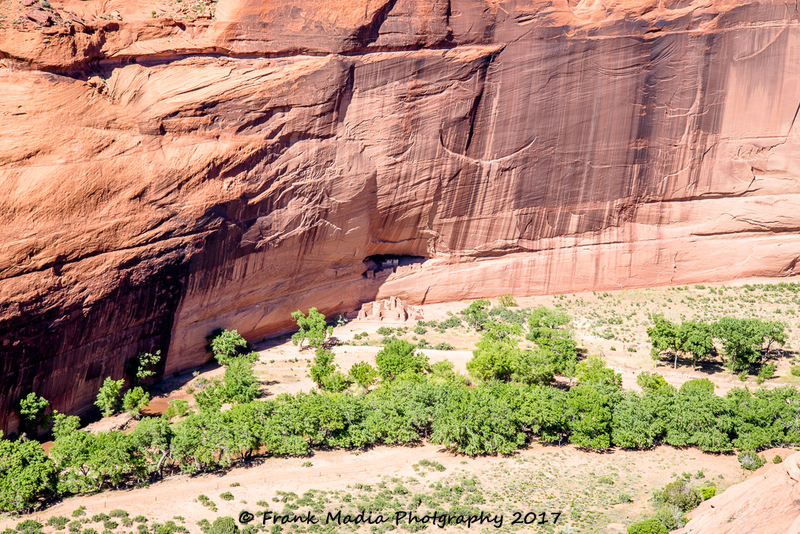 This is the entrance to the visitor center on the Utah side of the park north of Jensen, Utah. 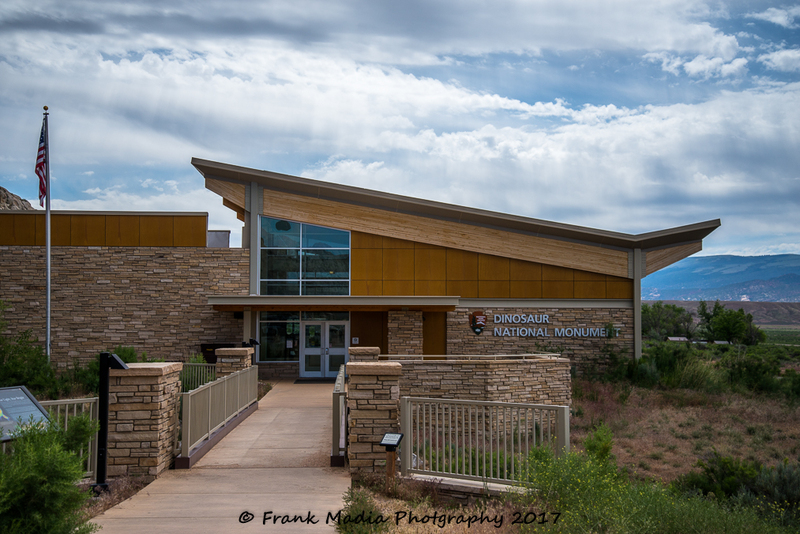 Like most visitor centers this one gives one the opportunity to orient themselves with the monument and all the protected property. The history of the area is displayed via videos and diagrams. This is also the boarding location for the buses that travel the short distance to the Quarry Exhibit Hall. Unfortunately, I made no photographs of the exhibit hall from the outside. Such a photograph would go a long way to illustrating just how big this particular dig site is. The next several photographs were taken inside the Quarry Exhibit Hall. I cannot overemphasize the enormousness of this exhibit. There are two floors to the hall, but they are not your standard ten foot high stairways between them. Nor is the top floor within the normal ten or twelve feet of the ceiling I would say that a 3 to 4 story building could fit inside this exhibit hall. The hall is a three-sided building against a solid rock wall where all the fossils in this and the rest of these images protrude from. This specific site within the boundaries of the monument has been completely excavated. That does not mean that all the fossils within the rock face have been exposed, however. In order to reveal any more of the fossils that may exist here would have meant the destruction of those that are at the current surface. 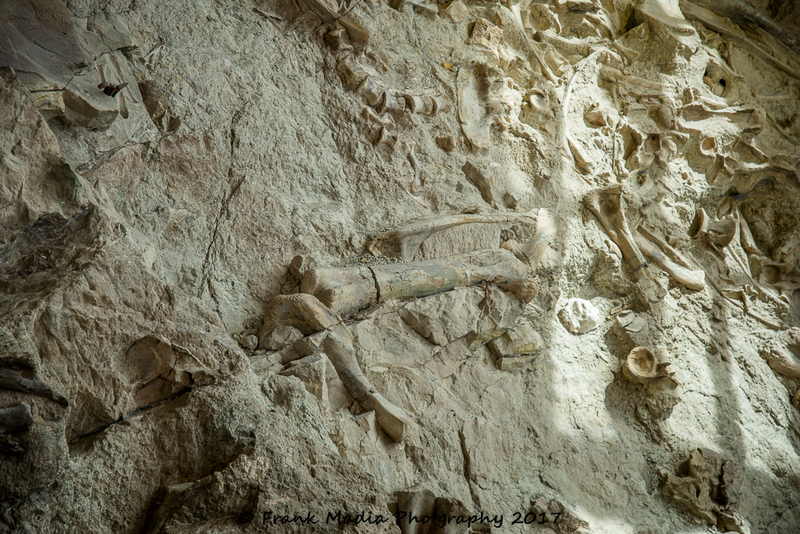 In fact, during the process of exposing the thousands of fossils we can now see, several smaller fossils were destroyed. The fine white lines that can be seen in most of these images are actual tool marks made by the paleontologists as they did their work to expose the fossils. This image is a good example of the conflicting light sources that exist in the exhibit. 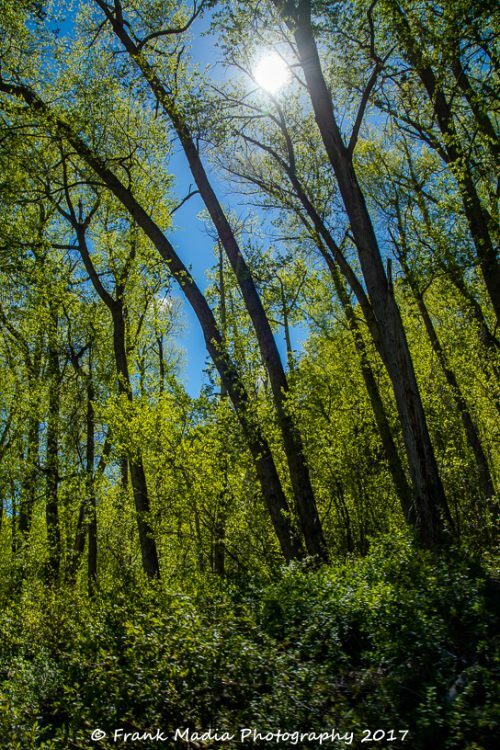 I had a spotlight lighting the center of this image with sunlight on the right edge. It is absolutely mind-boggling how the scientists knew where to chisel and where not. Remember they were not simply brushing or troweling soft sand away from these fossils. These bones are part of a very large sandstone formation. I titled the file that I have saved all these images and several more as Bones Bones and More Bones. It is obvious how I came to that title. 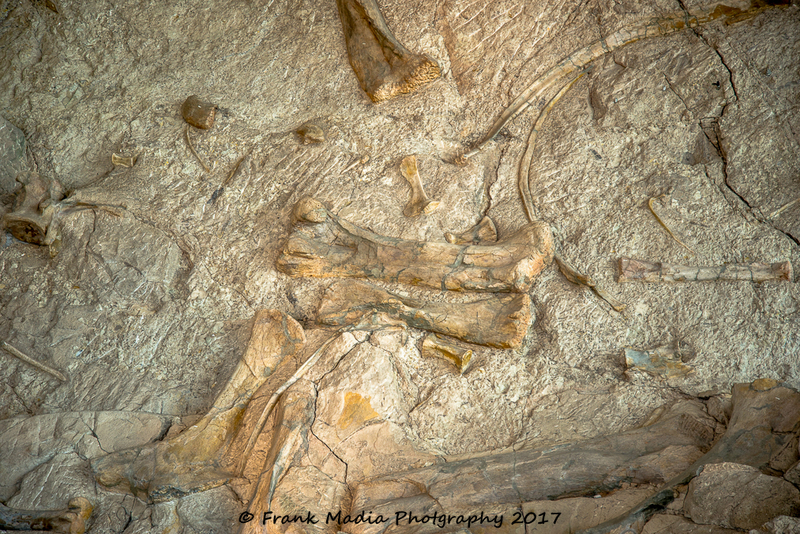 The large bones in the lower portion of this image were once part of an Apatosaurus. The bottom-center horizontal bone is a humerus. The bottom right side is a radius while the one above it is an ulna. Above the humerus is a scapula with another radius and ulna above the scapula. The large bone on the far left and pointing right at a 45° degree angle is another humerus from an Apatosaurus. The bone that this second humerus points to is the humerus from a Diplodocus. Above the second Apatosaurus ulna, is the caudal vertebra of a juvenile Apatosaurus. 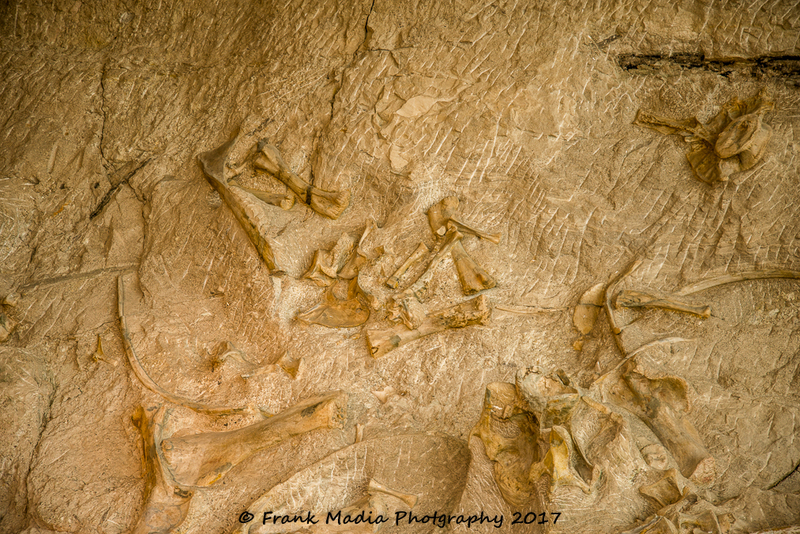 Most, if not all the bones in this image are parts of a Stegosaurus. 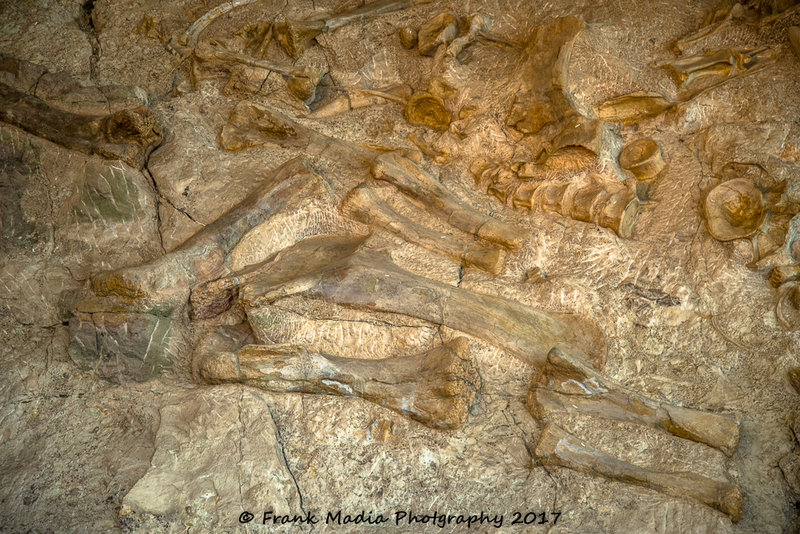 While to casual observer all these bones seem more like a mess of nature, to paleontologists they provide an enormous research field. The bones that are now exposed on the Quarry cliff were buried in an ancient river about 149 million years ago. Over time the sediment turned to rock, protecting the bones in a stone time capsule. The capsule was first opened by Earl Douglass, a paleontologist from the Carnegie Museum in Pittsburgh, PA, when he discovered eight tail vertebrae of an Apatosaurus in 1909. 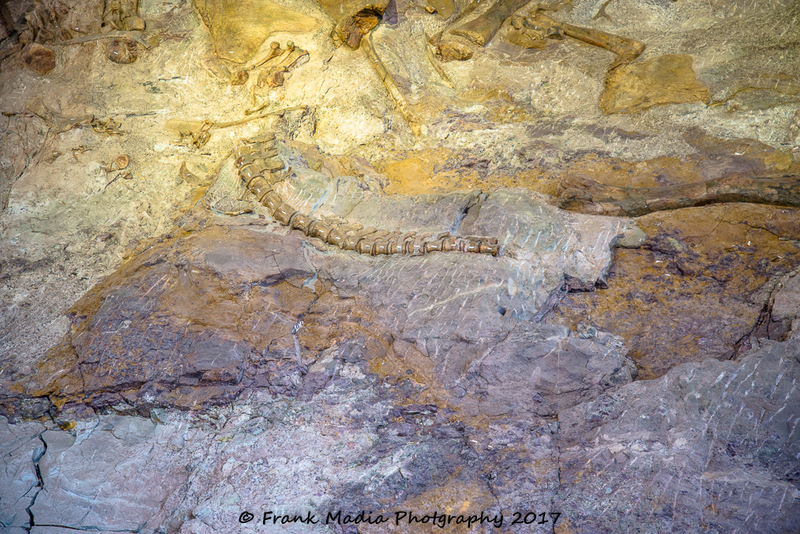 Eventually, remains of 10 different species of dinosaurs were discovered at the Quarry. 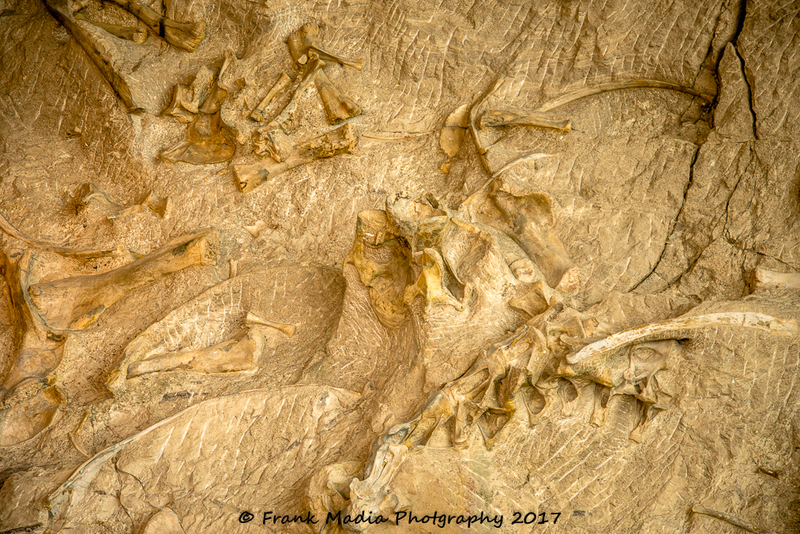 The well-defined row of bones in the center of this image is part of the cervical vertebrae of a Stegosaurus. This image shows more of the Stegosaurus. There are several layers exposed in this section of the Quarry. The very thin and slightly arch-shaped bone upper left corner is a rib. There are two sections of the vertebrae to the right. To the lower left of the second section of the vertebra is a plate. The plates are those fin-shaped objects that stick out above the back of this dinosaur. The visitor guide to the exhibit does not identify each bone depicted in the sketches of the various areas along the cliff face. 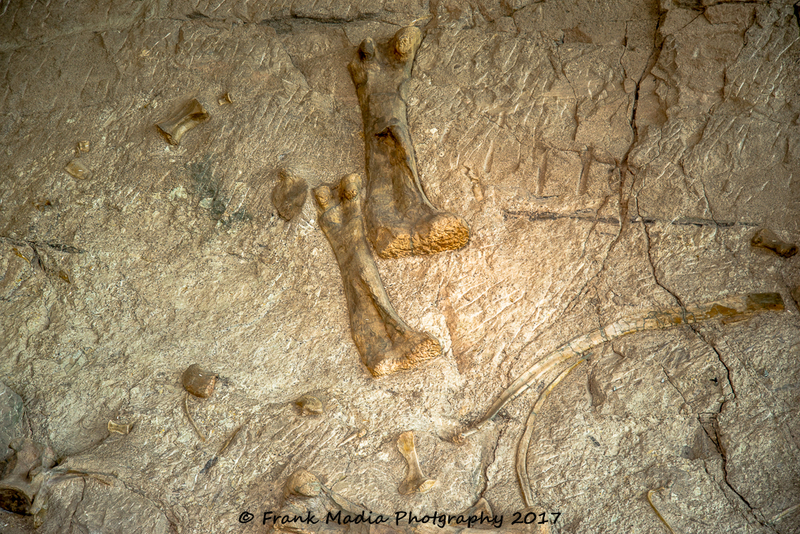 While I could probably guess at what some of these bones are, I would risk reading about my errors in the comments section of this blog. The lighting made this image really tough to bring out the details. However, the guide identified many of the bones seen here. Starting from the lower left and working our way up and right, here is what I know. This creature is, or was, a Camarasaurus. The first bone is a femur, followed by a scapula and then the one on the same angle is a fibula next to a tibia. The thin lighter colored bone between the second and third bones as well as the partially obscured bone below and to the left are both dorsal ribs. All of the thin bowed light colored bones are more dorsal ribs as are all the small bones on the left side of the yellowish cast portion of the image. I had trouble while at the exhibit controlling my impulse to continue making photographs. It didn’t get any easier when I was trying to decide which images to include in this article. For me, it was hard to go minimal. There is just too much to learn and share with anyone who may be interested. Okay, this is the final image for this stop. 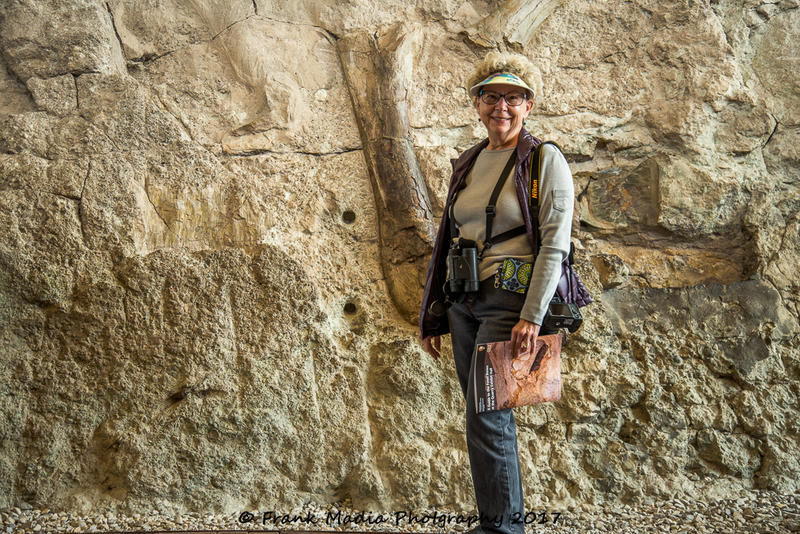 I put Connie in front of one of the many bones you can touch and caress to get a real feel for these amazing animals. I suspect this is a femur she is standing in front of. The guide Connie is holding is where I found the names of those bones I tried to identify. I was unable to find any corresponding depictions of the sections of the cliff face for those images that have no bones identified. In my last post, Spring of 2017 Part 1, I had some photos that were incompletely identified or just unidentified. One of my faithful readers refocused my memory by providing the location for the images which has allowed me to recover the information needed to complete the picture, so to speak. This image was made in Canyon de Chelly. While not 100% positive, I think the image is White House Ruin made from the overlook. 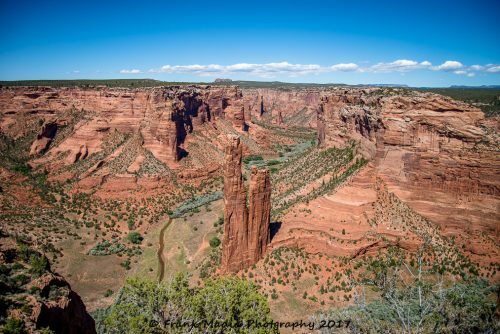 Canyon de Chelly National Monument. This is likely a Desert Spiny Lizard. It was on a reconstructed kiva outside the visitor center. We then made a beeline of sorts, to Yellowstone National Park. In Spring of 2017 Part 3, I will recount those last days on the road and the first week in Yellowstone before our volunteer job began. Stay tuned. Wow! I love the bones–I was watching a TV special on the day the dinosaurs died as a result of the giant meteor–Just the other night. And I love the color of the light green leaves–is there any green as fresh as that! I couldn’t wait to read what you so eloquently wrote and feast on the photos you took. Thank you, Frank, for including me in your informative and highly interesting and educational blog! I have friends who regularly take that train, but jump off so ewhere along the way to backback, then catch it back when they’re done. I’d have never thought of even asking to do such a thing. your photos are gorgeous as always. 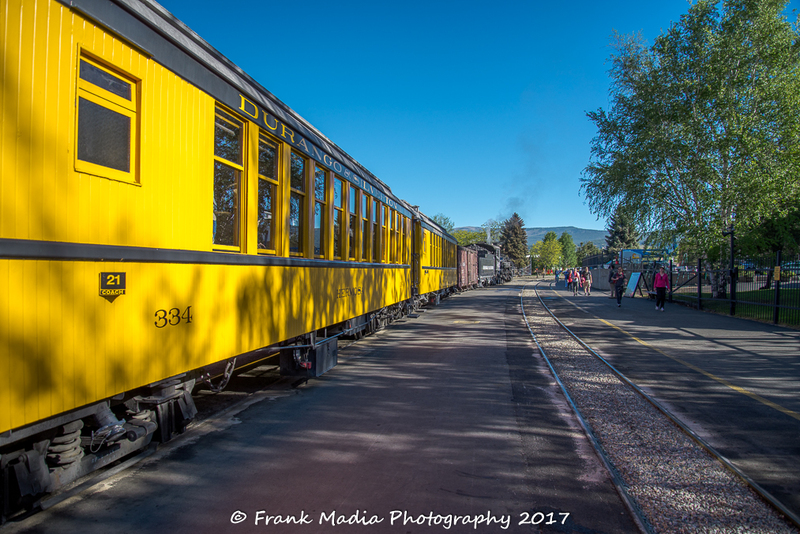 Enjoyed your pics and reading your blog, so many memories of the Durango train,one of Jack’s favorite! 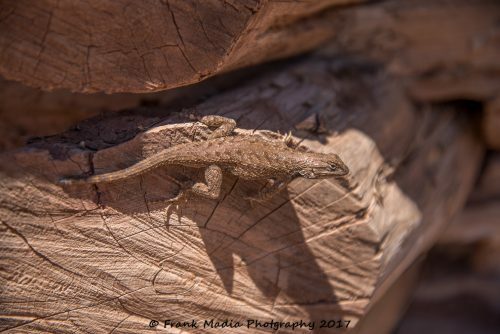 We first went on it with our three kids and several times after when we were “empty nesters” Now I want to see Dinosaur Nat M., you really took some great pics! Thanks so much.